Hooray! It’s time for my annual disambiguation of independent pharmacy owners’ true economics, courtesy of the new 2011 NCPA Digest sponsored by Cardinal Health. Pharmacy profit margins remain stable. An independent pharmacy’s profits from prescriptions are increasing, not decreasing. The average pharmacist owning a single pharmacy earned over $250,000 in 2010, but 7% less than 2009. The average pharmacist owning multiple pharmacies earned over $1 million, up 17% vs. 2009. These data have some limitations, but are certainly fair game for analysis. The NCPA data come from a self-selected sample. Pharmacies doing better or worse than average may not have returned the survey in equal proportions. Year-over-year differences may not be statistically significant. NCPA does not release information on samples size or provide confidence intervals around the point estimates in the Digest. The data were self-reported, not based on audited financial statements. Respondents could have made their profit data look better or worse than reality. The average respondent reported revenues of $4.0 million per pharmacy location vs. only $2.1 million per location in the IMS/NACDS data (as shown in The Pharmacy Industry's Evolution: 2000 to 2010). Many items on the survey instrument were not defined and therefore may have been interpreted differently by respondents. These data are fair game for analysis. The NCPA digest data are used for Congressional briefings and testimony, have been analyzed in peer-reviewed academic articles, and featured prominently in an expert report written on behalf of NACDS and NCPA in their lawsuit over Average Manufacturer Price (AMP). As an aside, NCPA uses the survey results to compute the $92.8 billion size of the independent marketplace as: Average revenues from Digest respondents ($4,022,455) X NCPA's estimate of independent pharmacy locations (23,064). If you think the survey undercounts smaller pharmacies, then you also think that the independent marketplace is smaller. As always, I welcome your comments on the computations below. Here are some basic definitions to clarify the pharmacy profit story. Gross Profit is the difference between the revenues received by a pharmacy minus the costs of products sold by the pharmacy. Gross profit measures the portion of revenues available to cover the operating expenses and operating profit of a pharmacy. Think of gross profit as Earnings Before Expenses (EBE). Gross Margin expresses gross profit as a percentage of revenues. This is a zero-sum formula. Increasing one part will decrease another. For example, increasing Owner Compensation will decrease Net Operating Income. A pharmacy could report a “net loss” if the pharmacy owner chooses to pay himself or herself a larger bonus instead of reporting a positive net profit. The NCPA Digest reports the sum of Owner Compensation and Net Operating Income as Owner's Discretionary Profit (ODP). Thus, ODP represents 2 of the 3 ways a pharmacy's gross profit can be spent. OBSERVATION 1: Pharmacy profit margins remain stable. In 2010, gross margins for independent pharmacies increased slightly to 24.0%, up 120 basis points from 2006’s 22.8% gross margin. Total pharmacy gross margin is at its highest level since 2003. The Digest notes that gross margin “…remained in the 22–24 percent range seen over the last 10 years.” This survey finding is consistent with the U.S. Census Bureau’s data, which show remarkably stable drugstore gross margins for at least the past 17 years. See Drugstore Margins Jump in New Gov’t Data. OBSERVATION 2: An independent pharmacy’s profits from prescriptions are increasing, not decreasing. Here’s a shocker: independent pharmacy profit margins on prescriptions have been increasing, not declining, over the past five years. Gross margins on prescription sales were 23.3% in 2010 vs. 21.5% in 2006. And as the chart below shows, prescriptions margins have increased consistently since the launch of Medicare Part D, although there was a slight decline of 10 basis points from 2009 to 2010. Average prescription prices have been flat due to increasing generic substitution rates. 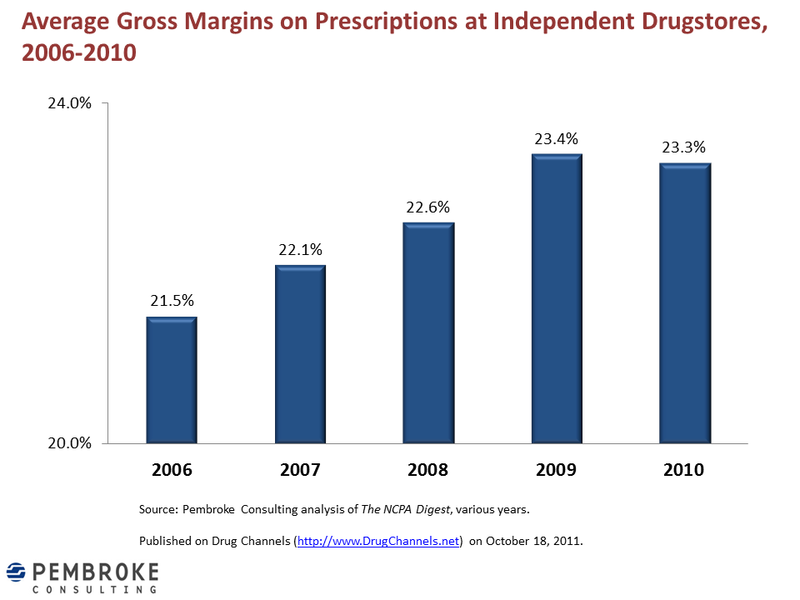 Nevertheless, gross profit dollars per prescription grew from $12.59 in 2006 to $13.43 in 2010. Another surprise: margins on front-end (non-prescription) sales have dropped sharply, from 38.2% in 2006 to 31.8% in 2010. I speculate that consumers are more price-sensitive given overall economic conditions, so they are shopping more carefully. OBSERVATION 3: The average pharmacist owning a single pharmacy earned over $250,000 in 2010, but 7% less than 2009. As in previous years, I compute the Owner’s Discretionary Profit by multiplying the median ODP by average revenues.1 On a per pharmacy basis, this figure fell again, from $274K in 2009 to $253K in 2010 (-7%). In 2010, 74% of independent owners had ownership in a single pharmacy. Thus, the majority of pharmacy owners saw a decline in personal earnings. Put another way, pharmacy owners have not been immune to broader U.S. economic problems. OBSERVATION 4: The average pharmacist owning multiple pharmacies earned over $1 million, up 17% vs. 2009. Intriguingly, the NCPA Digest reports that the average pharmacy owner now has ownership in more pharmacies—1.89 pharmacies in 2010 vs. 1.69 in 2009 and 1.49 in 2008. Put another way, the NCPA Digest imply that the owner of multiple pharmacies saw average earnings grow from 2009’s $958K (=$274*3.5) to 2010’s $1.1 million (=$253K*4.4)—an increase of $164K (17%). It should be apparent that these changes could reflect differences in the sample over time, but there’s no way to figure it out from the Digest information. If NCPA is willing, I’d be pleased to re-analyze the raw data. WHAT HAPPENED TO MARGINS BY PAYER? In previous years, the NCPA Digest has reported the average gross margins and percentage of total prescriptions for third-party payers—Medicare Part D, Medicaid, and other third-party programs. A little math can provide the missing average gross margin figure for cash-pay customers. Here are the data reported in the 2010 Digest. (This chart appears as Exhibit 33 in The 2010-11 Economic Report on Retail and Specialty Pharmacies.) A pharmacy’s gross profit margin from uninsured prescriptions was about three times as high as the profit from a third-party paid prescription. Oddly, these data have mysteriously vanished from the 2011 Digest. NCPA told me that the survey instrument was “streamlined” and 20 out of 130 questions were cut. 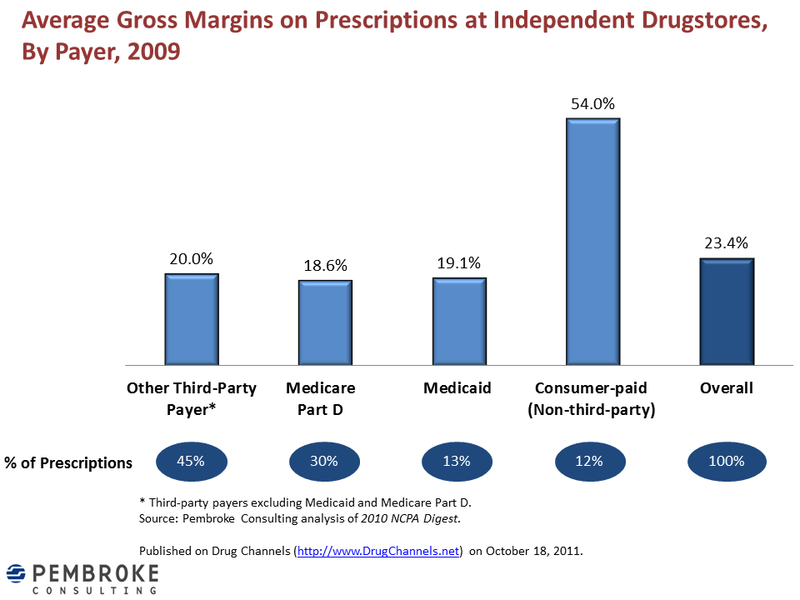 Average gross margin by payer was omitted, although the share of prescriptions by payer type was collected and reported. Perhaps I'm being overly suspicious, but I imagine that it’s hard to lobby for more money or special breaks when the association’s own data show a “soak-the-uninsured” pricing strategy. See Pharmacy Profits and the Uninsured for more on this topic. Some of you will not agree with the numbers above. Some may feel that the limitations overwhelm our ability to interpret the information. About half of the pharmacy owners will surely grumble that they are below average (except in Lake Wobegon, of course). Please feel free to leave me your thoughts below. Just don’t forget that the digest data are frequently and authoritatively cited as a valid representation of the independent pharmacy industry. I am merely computing and presenting the information in a novel way, despite the acknowledged shortcomings of the data. 1 Math geeks should not fret that I am multiplying an average by a median. the distribution of Owner’s Discretionary Profit Percentage in the 2010 Digest has a very slight negative Bowley skewness (-0.03), i.e., the average is less than the median. However, this figure is not statistically significantly different from skew=0, i.e., symmetry, so the average and the median are pretty close. See “Bonus Comment For Math Geeks” at the bottom of 2009’s NCPA Responds to Drug Channels. As for the gross margin by payer type, as a pharmacy owner I think your interpretation of the past data is a little misleading. Cash payers by necessity select cheaper medications. For instance, at our store, we dispense roughly 85% generic meds to cash pay customers. Many of these prescriptions are 90 day supply. This is way better than PBM's do with all of their touting of high generic dispensing rates. Because of this, it's pretty easy to have 50 percent margins on these prescriptions without, as you would say, "soaking the uninsured". In fact, most of these fall well below your stated $13 per rx that is out there as a whole. While we are at it, I have an idea for another analysis that I would like to see this site carry out and make more public. I find it hard to believe that PBM's (like express scripts) make 6.5% gross profit. Tell me why/how such a company would pay $29 billion for another company in the same industry who earns such meager profits. Be sure to include rebates into you calculation. Also, spread pricing. Oh wait, those are secrets.
" The average respondent reported revenues of $4.0 million per pharmacy location vs. only $2.1 million per location in the IMS/NACDS data (as shown in The Pharmacy Industry's Evolution: 2000 to 2010)." Only successful pharmacies participate in ncpa survey. The struggling pharmacies do not participate. I agree with you ncpa should not portray this as an accurate market survey. As always, great info. And love the MN comment! In regards to the statement "the PBM earns minimal spreads and/or admin fees", what dollar amount or percentage of the total reimbursement would you consider to be "minimal"? I will follow up with a true scenario when I read your response. Thank you. I recently discovered that my local independent pharmacy was much cheaper ($60 vs. $180) than my HSA sponsored mail order (Medco). I thought that mail order pharmacies used their buying power to buy drugs cheaper and pass that savings on to customers. Boy, was I wrong! Wow, you cite very compelling data! I'll be passing your comment to Governor Cuomo. I'm sure he'll be convinced to sign the anti-mail order bill based on your anonymous comment about an unnamed drug covered by an unknown insurer. Don't be discouraged by the negative comments. I understand what you are saying and appreciate your critical analysis of the data. The report sounds suspect to me based on your critiques, but you are fairly portraying what's in there. Just curious, would you publish and discuss with the same vigor a comparative of employer claims billed to the employer vs. what the pharmacy got paid? (actual claims, not PBM spun) have such a file that showed PBM spread of over $175K on 20,000 claims? Or are you just a shill for the PBM industry? Blue Cross, Medco, Generic Zonegran. The patient would love to enlighten you, how shall I have her contact you? You can always send me an email, but I really have no way to verify whatever you send me. And as my granpappy used to say, the plural of anecdote is not data. BTW, have you ever considered the implications of what you are suggesting? That somehow, a few companies have managed to bamboozle every employer, health plan, the Federal government, the Defense department, and all other payers, along with their armies of consultants and lawyers? That these payers are just too dim-witted and foolish to realize what's going on, so they need to be saved by the owners of independent pharmacies, the lone voices of truth in the healthcare wilderness? I pondered this question in Why do pharmacy owners care about PBM transparency?. Perhaps it's time for an update. Mike, you are a fool. Dr. Fein is biased and hates independents. FWIW, not true. I didn't publish the NCPA Digest. I just did some math based on the published numbers in the report. That is exactly what I am suggesting. The question here is are you willing to examine raw data (verified by employer and pharmacy) that might prove your theories about PBMs to be untrue? We have multiple employee claims files available.BTW: my apologies for multiple posts, I phone glitch. Adam finally hit the nail on the head that is exactly what we as indepedents are saying. So lets get it all out in the open, ie transparency and let the taxpayers, employers, and everyone else you mentioned decide for themselves. What are they afraid of ? Surely not the little indepedent pharmacy! Honest and integrity always win out in the end. Indepedents keep doing what you do. Pbm's keep doing what you do. In the end it will all come out in the wash. I'm glad i'm on the side of the independent (as an indepedent owner). Unfortunately for some struggling indepedents there will be casualties but that's the cost of war! Upward and onward! At least 3 times in the article you thankfully acknowledge limitations or shortcomings of the data. Yet you willingly try to make observations of this crappy data. If what you are looking at looks like dogshit, and smells like dogshit, then any analysis and observations can only conclude that it's dogshit. Trying to make anything more out of it simply wasted time. Like the 5 minutes I spent reading the article. (posted on 10/12/11). Let me know how it goes. I look forward to reading a published report. Please send it to me when it is released. I am quite sincere in wanting to publish actual data on how a PBM earns profits. To be sure, you will get a copy, as you know though University research takes time. On that subject your thoughts on the late Robert Garris' work exposing PBM spread on generics? I have to ask though, surely your having a PhD in economics means you are capable of analyzing raw data and forming a conclusion about a particular PBM for a particular employer. I have reviewed this page and find many examples where you seem to endorse the current PBM business model. To be frank, I'm just wondering as to whether you would say "wow, this PBM and consultant really screwed this employer in the case" if you saw the data yourself? You are mistaken. I do not have a dislike for independents. As you tell from the comments above, I get attacked whenever I analyze the published data put forth by the NCPA as an accurate depiction of the industry. No one is suggesting that pharmacy owners should live in poverty. However, the NCPA Digest data are being put forth to influence U.S. public policy and lawmaking, as clearly seen by the NCPA's press release and Congressional briefings. I suspect that pharmacy owners don't like when I highlight uncomfortable implications of these same data. Come on, Adam, that's a copout! YOU are the supposed economic expert. If YOU know and acknowedge in your article that you know the data is crappy, how can YOU go on and make 4 observations based on that crappy data as if they are scientific fact (in BOLD letters I might add)? I'm certainly not convinced. You are doing a great disservice to the economic community trying to show us these observations are accurate when you yourself acknowledge in the article that the data is garbage. I am highlighting (perhaps embarrassing or uncomfortable) implications of the Digest data. Anyone can do the same math that I discuss above, so my observations are accurate given the data. I am not aware of a comparable information source, so we're stuck with the NCPA Digest, warts and all. I asked NCPA for clarifications and they wouldn't even tell me the sample size! FYI, I have critically examined numerous studies over the years, from corporate-funded white papers to peer-reviewed journal articles. I do my best to highlight interesting or unexpected observations about the Drug Channels universe. Check out the Best Of posts. As you'll see, I never shy away from stating the limitations of a particular data set. Wherever possible, I include links to original sources and explain my methods so that people can make up their own minds. In my opinion, it's especially important to examine the Digest data because they are being used to lobby for specific changes to U.S. healthcare policy and laws, as the links above illustrate. What's so bad about taking a closer look? Adam, I don't agree with your findings(I know you can only use the data you are given) but, I thank you for having the balls to post this every year. So if the employer is misinformed by mistakenly trusting the benefits consultant who failed to disclose a conflict of interest with the PBM, and the PBM then screws the employer with so called "transparent pass through" plan, you think that is okay? You never answered my question about reviewing the data, it enlighten you about the amount and frequency of spread as well. PS: I watched the Brady Bunch to as a kid, Greg got screwed with: "Caveat Emptor (translation: Let the buyer beware)" too! I guess we just have to disagree then don't we? What scares me about your article is how you in one breath point out that the data is unreliable (Paragraph 2 "These data have some limitations", then under the DATA section you have 5 separate bullet points as to why the data is unreliable) then quickly turn around and immediately make 4 bold-faced "observations" from this unreliable data as if it were indeed reliable! Look at your headline for crying out loud, you title it "The True Economics of Pharmacy Ownership". Well is it true or is it unreliable and "has some limitations"? Before I stumbled across your article I didn't know you from Adam (pun intended). I have not read NCPA articles and perhaps if I did I would disagree with their observations just as much as yours. But I find your article here outlandish, especially for one who is supposed to be a trusted economist capable of peer-reviewing journals. I can't imagine any economist worth his salt to make such judgements on such poorly acquired data. Not so long ago our U.S. government used some crappy data and ended up making the observation that Iraq had weapons of mass destruction. Please learn from that. Fine, send me your data. I'm sure companies like Goldman Sachs, ExxonMobil, and Boeing appreciate how much independent pharmacies are willing to help them! WMD? A bit grandiose, don't you think? I'm not trying to be Tobias Fünke with a new cellphone! "So our non-insurace prices via you example seem inflated. They are somewhat. It is to make up for lost revenue on insurance claims." I get your point, your wording just seemed too misleading or biased against independants. My point is we are still cheaper(lower mark up) than our competitors but we(retail) are all getting screwed by these PBM's as we watch out profits continually go down and the cost of health care and insurance premiums continue to incease. Wheres all the money going? I know that one of the big 3 PBM's CEO made 26 million dollars, as his salary, last year and they are just suppose to be a middle man processing claims. Whats your opinion on this from an economic standpoint? So what does the "expert" deem a fair mark-up in dollars per Rx over actual acquisition costs for all prescriptions (covering operating expenses, overhead, and a fair profit)? just awesome stuff.. sounds very cool as well as too interesting.. i really like it..
thanks for you to share with us.. keep it up.. keep sharing.. I'll ask again, what does the economics "expert" deem to be a fair cost to dispense a prescription? To be more specific, if pharmacists were willing to dispense based on actual acquisition cost what were be a fair mark-up per prescription that would cover operating expenses and a fair profit? As I have explained many, many times on Drug Channels, marketplace competition is the best way to set price. This is already starting to happen for cash-paid generic drugs. But as you know, 90%+ of people do not pay the full cost of their drugs, so competition shifts to the pharmacy-to-payer level and third-party payers try to influence the consumer's decision. If you ask someone else—such as your employer or the American taxpayer—to pay for your drugs, why shouldn't they want you to save them some money? And why can’t they encourage you to use the lower-cost channel for the payer by sharing a portion of these savings in the form of a lower co-payment? Example: Aetna and Coventry Join the Part D Preferred Network Party. P.S. Congratulations! You win the "most comments in a week award!" ......and you win for the most cop-outs! You pontificate with neither accurate facts, nor courage of conviction. Your answer shows you know nothing about what it cost to dispense a medication or operate a business. But since you use market competition as your answer. Can I quote you as being opposed to any mandatory mail order. Surely the economist can see that MMO restricts free market competition. Wow! Now lets wake for Adam to backpedal out of that one! I was not being insulting, simply giving my opinion of your answers or lack there of. drugs, why shouldn't they want you to save them some money?" Please sir, simply answer the question. Since you support free market competition, do you not agree that MMO restricts competition and is therefore bad? I have sent you an email with a mail order file, along with my name and contact info. I would be happy to discuss this example of mail order (Fraud?) and many more at any time. "For the same script, does your pharmacy receive the same revenue from a cash pay consumer as from a consumer with third-party insurance? I'd guess not, so my general point is still true." Is that a real question? If we did, what purpose would insurance serve? According to you, that what PBM's do, they negotiate better prices for everyone. Unfortunately, their is no negotiation allowed on our end (look at ESI/Walgreens). Does the doctors office charge their patients that pay cash the same as what the insurance pays them? Of course not. Revenues from those different consumer groups is most certainly not the same, because third-party insurance companies bleed healthcare companies dry to increase their own revenues and force prices down on one end while driving up costs for health benefit managers on the other! Slams NY Anti-Mail Bill; Insights for ESRX-MHS? Adam, this is off the topic, but how do you think the merger between express scripts and medco will affect brand manufacturers? With this behemoth PBM, there will only be so many drugs they can include on their formulary. For example, if they include as their preferred statin drug lipitor(I know its going generic, this is just for example) then what will happen to the companies that make crestor, livalo, and other name brand drugs for cholesterol? It seems like this consolidation will hurt some drug companies as well. Couldnt agree w you more. All I meant was that the 54% GP would likely come down some if we(all retail) were not getting so beat up on the other 90-95% of prescriptions filled. I am just not all that talented of a writter and you put it much better. However Adam has not responded to either of us, may be a bit over his head at this point. I understand the issues quite well. However, I chose not to respond to the anonymous, profanity rant by "UKCats#1." When was the last time you spent an entire day behind the counter in a independent pharmacy? To try to compare insurance covered prescriptions to those paid in cash is totally incorrect. You know that, but refuse to address it properly. When we dispense a 90, 100 or even 180 day supply to a CASH customer, there is NO insurance covered prescription to compare; the insurance companies seldom allow those quantities in a retail store. And when theay do, they charge the customer multiple copays. Again, you know this, but refuse to accept it. I invite you to spend a day in my store in our small town of 500. But then again, you are too much of an expert to understand what happens in a real store in a real community. An editorial writer and a study where the FTC rubber stamped one sided data provided by PCMA is the best you can do? I won't even get into the politics of former PCS Board member Bush being in the white house and therefore in charge of the FTC at that time (a later discussion). But, dang this "I was for free markets before I was against it" is a faster flip flop than John Kerry! Adam your data on prices of generic medication is not current. As we speak some generic prices are skyrocketing from $2.00 to $20.00 or $40.00 not really sure of the reason but it is happening. Maybe a wee bit grandiose but probably not. It does help to get my point across though doesn't it? If this article is being used for business judgements or political policy it makes you that dangerous. So is it true or is it unreliable and has some limitations? I think it's clear which way I'm leaning. Adam, I am a pharmacist in West Virginia. Yes I do own this and another pharmacy with a few other pharmacists. I can tell you in our case we have never made anything close to what the digest quotes. It our best years we didn't make this, and trust me these past few have been far from best. My point is on one hand you admit the data is flawed , yet you insist, or imply, the we the independant pharmacies across america are fleecing or getting rich of the backs of others. We, and I am speaking for myself and my group in general, get involved with the community, donate back to the schools and local organizations as well as help educate the community on medications, healthcare, etc. We proactively try and help all those that utilize our services. We contact doctors to work together to find drug therapies that are affordable for our patients. The last thing i want to do is initiate a patient on something they can't afford. I can't tell you the times we have opened charge accounts for patients that had no ablilty to pay in cash, but we did it because we cared. Not saying it was necessarily the best business decision, but it was the right moral decision. How many PBMs would do such a thing? How many chain pharmacies give back to the community (I can think of only one chain that tends to get involved with community projects). How many mail order houses give back. The short of the matter is we support those that support us. You make it sound like the pbm's have all the answers. In short, the truth is they control all the purse strings. Now how do you expect mail order to be competitive when they are owned by the pbm's. Its not like after a business chooses an insurance provider and they mandate mail order that that business is shopped around, you don't get the luxury of possibly utilizing the other 2 mail order houses, they are not in the game. In economics, when limitations of choice are diminished it doesn't lead to cost control. basic supply and demand. If supply is limited to one provider, then they call the shots. I am not here to debate you, just feel you misrepresent the truths in the system. Adam in closing i will say that one thing that is always a constant. When I am having a good day I can always count on pulling up your blog to make it turn bad again. UNTIL YOU HAVE OWNED AND OPERATED AN INDEPENDENT PHARMACY- SHUT UP! Adam, the problem is that the Mail orders are not passing on their discounts to the end consumer. You think the discounts they buy at is where they make their money. What happend to the back side discount from the drug manufacturers to be put on fomulary, or sliding discount that they get from market share shift by drug manufacturer?? Do you think these things are passed on. Its easy to be the PBM and say we saved you X dollars compared to what pharmacy Y submitted as usual and customary. But they don't tell you they only paid pharmacy Y $12.50 on a $75 claim. They then send eob to employer saying we can save you $30 by filling for $45. Now mail order got paid $45 pharmacy Y got paid $12.50 for same drug. Who made more money? Based on a premise that they were saving the employer money, the PBM controlled mail order house made 32.50 more than pharmacy Y. Now we see why their CEO's command such high salaries. Probably not?!? Gee, as far as I know, my blog hasn't cost $800 billion or killed 4400 brave U.S. soldiers. Guess we'll have agree to disagree on that one. No data set is perfect. But the four observations above are falsifiable, refutable statements. Multiple data sources (beyond the NCPA Digest) do not allow us to reject them as untrue. So, they are conditionally accepted as accurate. When and if they are falsified, I will surely cover it on Drug Channels. Read some Karl Popper for more. FYI, I will address this issue in an upcoming post reflecting on the many comments to this article. Adam, I too am an independent pharmacist at heart. But I can tell you that when PBM's really gained a strong market foothold in the mid 90's that pricing indeed became "somewhat" non-competitive. I can tell you that the items which were traditionally sold at or below cost in many stores were now sold at a profit. Items such as birth control pills, insulin, and other high commodity / image items were often sold at dead net cost. With the growth of PBM's and 3rd party payers, consumers began to pay flat copays. To avoid staying out of hot water vis a vis usual and customary pricing regs, most pharmacies raised their pricing to stay above the "pricing floor". Pricing floor. That comment wreaks of anti-trust. And that was a big change in our pharmacy world 15 - 20 years ago. Holy cow Adam, you missed the whole point of the WMD analogy. I wasn't accusing you of killing U.S. soldiers. I'm merely saying that your observations of pharmacy profits, margins, and earnings are likely a fallacy and don't reflect the real world we live in today because the data you're using is like the data we were getting on WMD, "unreliable and has some limitations". So the lesson we learn from this is that if we KNOW and ACKNOWLEDGE that the data is flawed, we must NOT conditionally accept your observations as accurate. Adam, I sincerely apologize for my rant above, and most certainly apologize for using profanity. It was certainly not necessary. As you can see, this is definitely an issue that all community pharmacists are concerned about and it tends to get us a little riled up at times. While I undoubtedly disagree with nearly everything you say, I do respect your knowledge of economics and statistics, although calling my statement from earlier profanity-filled was not your best statistical work. I pasted it into microsoft word just so I could tell you that 1 of the 745 words in that post were profane, not hardly profanity-filled in my opinion! I too have followed this blog for some time. I agree most of us never comment. My feeling was mostly to what avail do I need to comment on these things, just I persons opinion. I think the most offensive part is the picture of all the money being stuck under the mattress. As I said in my comment, I'm not here to argue or debate, but present the facts. We in the industry know the "digest" is a skewed finding. Adam himself admits they data is questionable. I agree some have been in attack mode, but I can't say as I blame them, He makes it seem as though we are all out robbing america and that simply is not the case. LOL! You just (inadvertently) illustrated mb's point perfectly! mb - Thanks very much. Ironically, all the crazy rants from pharmacy owners actually just confirm that I have touched a nerve. I am alos part of the "silent majority." Adam is fair and objective with the data. I don't always agree, but he makes me think and challenges my preconceptions. I look forward to my dose of Drug Channels! Holy cow, Adam, you missed the whole point of the WMD analogy! I was not implying that you killed anyone. The point is that the observations made from lousy data were wrong! In reality there were no WMD's! We must learn that when the data is unreliable and "has some limitations" that any observations must NOT be conditionally accepted as accurate. Making assumptions can be downright dangerous. Adam, I'm not real clear on your point since your reply is what mb suggests is an "incredibly ignorant single line observation." The only point I have illustrated is how the grandiose perceptions of a middleman industry with little to no true interest in patient health and well-being has led to the inability of actual healthcare providers to perform their duties to the fullest extent. I'm glad to know that based on your agreement with mb's post, that you see no value in Pharmacists and the work they do. When all of the Pharmacists and their respective Pharmacies are put out of business by your clientele, what course will you recommend that they take. How will an industry of data processors manage to persuade state and federal legislators that they are the answer to an ever increasing healthcare crisis. Surely you can't expect that they will be able to meet the needs of the sick and needy? Perhaps in your grandiose perceptions you do! At the pace they are going, it won't be long until we find out. The only thing comical about any of this discussion, is that you fail to see anything but your own highly overvalued and desperately incorrect assumptions. I will gladly cease my "rants" as any discussion with you seems to be the equivalent of trying to teach a donkey to fish. Have a nice life and keep up the shoddy work. Someday you will be in a pharmacy asking for help when you can't get in touch with your concierge doctor. Hopefully they will still be in business, or you could just try calling Express Scripts. I'm sure they will be happy to mail it to you. Lets just hope its not an emergency!! Go ahead and tell me I'm crazy! Point taken. It was a profanity-spiced (not -filled) rant. Still puzzled over the username "UKCats#1." A fan of British felines, I suppose. I've read all of these and can't find a crazy rant from a pharmacy owner anywere. Which comment are you alluding to so we can figure out what you think is a crazy rant? I’m a new reader to Drug Channels. From the Pembroke Consulting Website: “Effective channel management starts with an economic understanding of how the revenue from an individual prescription gets divided between the manufacturer, the wholesaler, the pharmacy, and the PBM”.I observed little substantive in Drug Channels toward this core value. Rather, the bias in support of PBMs and curious antagonism toward independent retail pharmacy was evident. If this knowledge exists, rise above the bias, disclose conflicts of interest, and be a trusted source of pharmacy industry economic data.Macro-economic conclusions begin with an understanding of micro-economic detail. Toward the understanding of how revenue from an individual prescription gets divided, it would be helpful for a beginning understanding if one prescription could be followed through the revenue flow. I’ve been shown many examples, but here’s just one: Drug/ Strength/ Quantity: Amitriptyline 100mg #30 Retail Pharmacy Cost: $1.15 AWP: $33.33 Retail Pharmacy U&C, using AWP-based formula: $45.66 Caremark Drug Cost Allowed: $2.26Dispensing Fee: 1.50Total Payment: $3.76 Caremark Paid: $0.00Customer Copay: $3.76 It doesn’t take an economist to know that the pharmacy, whether mail order or retail, loses money on this. However, other than for the drug, disregard costs for now. The need exists to follow the revenue flow. What does Caremark do with this transaction? How do they represent this cost to their customer and what do they get paid? Do any additional revenue channels exist? Do they use the $45.66 in a comparison of how they or mail order will save money? If these questions can be answered, perhaps the economic understanding IS possible.